Now that I have your attention, I’ll repeat it again – love can be scary. It has frightened me many a time because it requires such vulnerability, compromise and dare I say surrender. 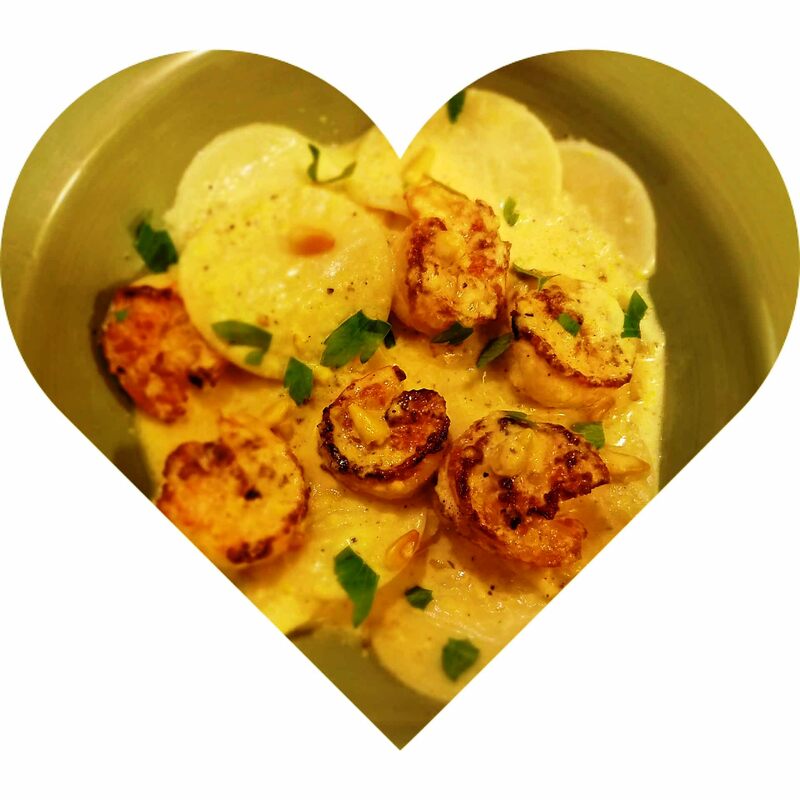 Why am I, a food blogger, talking about love? 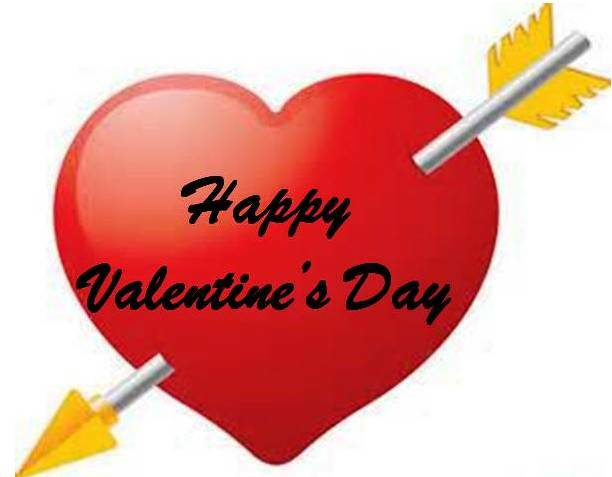 Valentine’s Day has a way of making me think about the pursuit of love and more importantly, the preservation of love. We’ve all heard the adage that the way to the heart is through the stomach, right? Well actually you heard it this way; the way to a man’s heart is through his stomach. But I submit that this phase should be gender neutral because my heart has been enraptured a time or two by a gentleman whose fearless culinary skills took my breath away with each bite of a wonderfully prepared meal he made for me. Valentine’s Day is approaching and perhaps you had a fleeting thought of making a romantic meal then that thought vanished as quickly as it appeared. I say be a fearless Valentine and make that romantic meal. 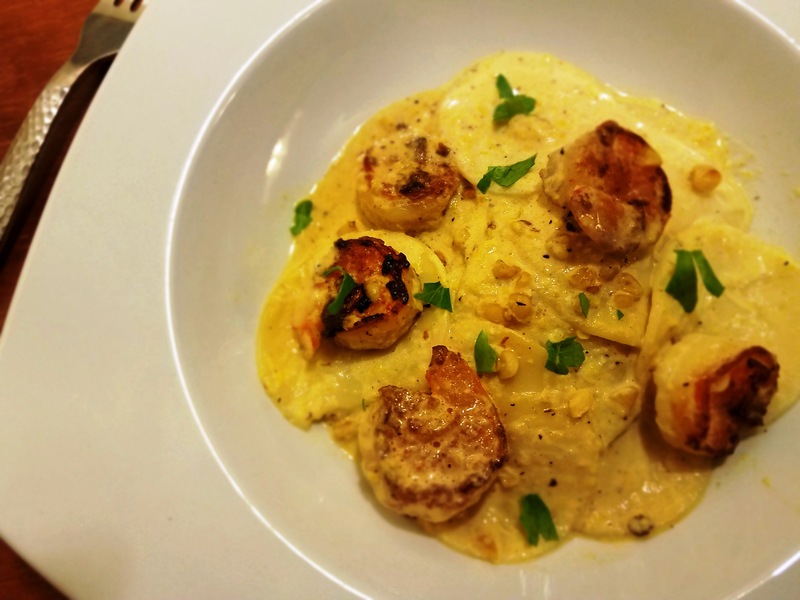 My Roasted Yellow Bell Pepper Alfredo Pasta with Pan Grilled Shrimp is a fearless choice and Valentine’s Day worthy. The pan roasted yellow bell peppers and the hint of nutmeg makes this creamy sauce warm and cozy. The grilled shrimp makes it decedent and satisfying. 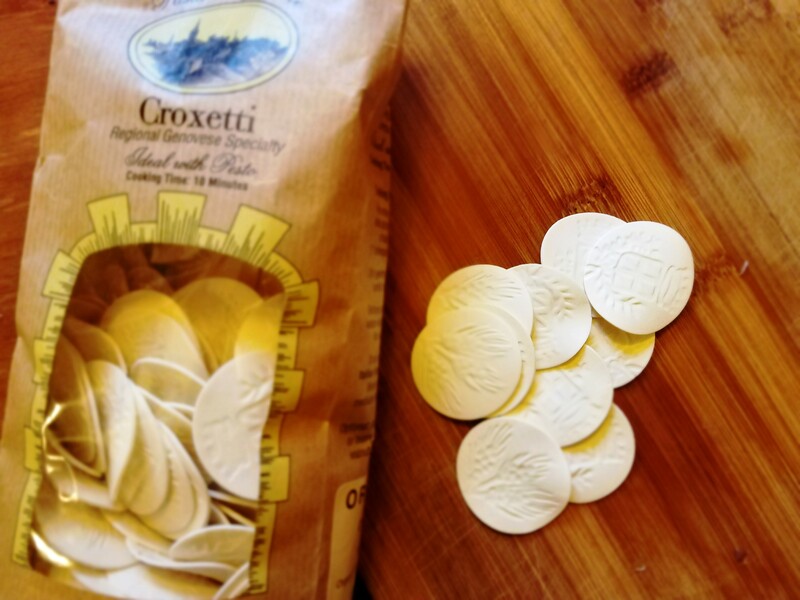 If you can find Croxetti pasta, you will certainly elicit a “wow what an interesting pasta” response. If you can’t get your hands on a bag of Croxetti, use Farfalle or Bow Tie pasta. Yes, this dish arouses the palate and the senses as well. Salad featuring your favorite garden greens. Be adventurous and add some thinly sliced Asian pears or Honeycrisp apples brushed with a little lemon juice, walnuts, cranberries and a little roughly chopped fresh mint. Toss the salad with a delicate champagne vinaigrette you can purchase from most grocery stores or specialty markets. 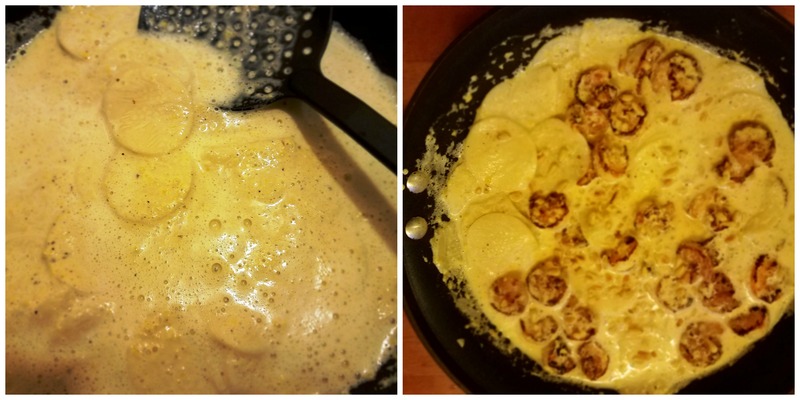 Yellow Roasted Bell Pepper Alfredo Pasta with Pan Grill Shrimp – recipe below. Pound cake (store bought or homemade) with vanilla ice cream drizzled with a Limoncello liquor and shaved white chocolate if you dare. If you decide to pass on making this meal for Valentine’s Day, by all means plan some time to make it at a later date. The love shown in making a meal for someone who puts a sparkle in your eyes shouldn’t be limited to Valentine’s Day. Preparing a meal for that special someone is definitely a way to their heart all year long. To a non-stick skillet set on medium heat, add pine nuts and stir until lightly browned. Remove from pan and set aside in a separate dish. Rinse shelled and deveined shrimp and pat dry. Add a little cooking oil (about 1 tablespoon) to a non-stick skillet set on medium heat. Add half of the shrimp, lightly sprinkle with salt and cook until medium brown on both sides. (Remember over crowding the pan will cause the shrimp to steam instead of cook and get a nice, brown color.) This may take approximately 2-3 minutes for each side until they are done. Remove shrimp from pan into another dish and keep warm. Add more oil if needed and repeat with the remainder of the shrimp. When done, remove and cover with foil to keep warm. Lightly coat a non-stick skillet with cooking spray. Heat pan on medium heat. Add bell pepper strips and brown on both sides. Color should be slightly charred. Remove from heat and cool. Place bell pepper on a cutting board surface and chop into pieces. Set aside. Begin cooking Croxetti or bow tie pasta accord to al dente directions. In the same skillet used for the bell pepper, add butter. When melted, add chopped onion and sauté on medium heat for 2 minutes, stirring frequently. Add garlic and sauté 1 minute. Add half and half, a pinch of nutmeg, salt and Parmesan cheese to pan with the onion and garlic mixture. Cook on medium heat, stirring frequently about 2-3 minutes until sauce is thickened. Remove pan the from heat and carefully pour sauce into a blender. Add chopped bell pepper to the blender. Place a towel over the blender top and hold it down securely. Blend the mixture until smooth. Pour mixture back into a skillet. Add a little cracked pepper. Heat about 2 minutes, stirring frequently. Add cooked pasta and lightly toss pasta until it is completely covered with the sauce. 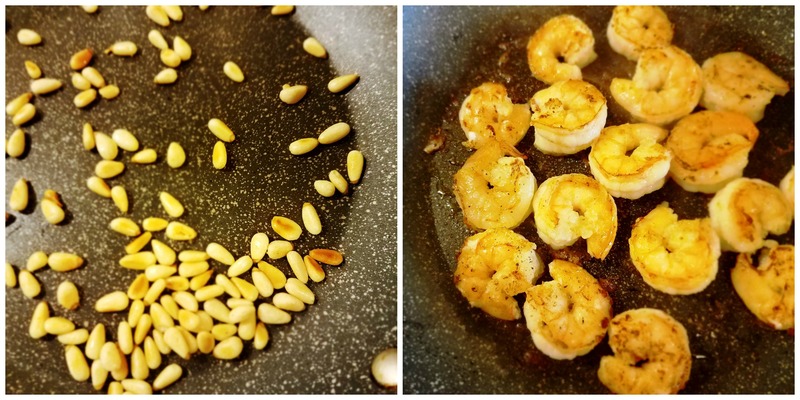 Add pan grilled shrimp to pan and sprinkle with toasted pine nuts. Serve with fresh chopped parsley and addition grated Parmesan cheese if you like. He reached out his hand and slowly grasped the cup of iced Café Americano from her hand.